This page is a summary of Investments to End Poverty Chapter 3. Official development assistance (ODA) is strictly defined by the Organisation of Economic Cooperation and Development’s (OECD) Development Assistance Committee (DAC) as concessional funding provided by its members to support the welfare and economic development of an agreed list of developing countries. ODA is unique in its focus on poverty. While the terms are often used interchangeably, aid is the wider range of development assistance of which ODA is one part. But there have been calls for a new ODA definition that reflects the changing landscape of aid and the emergence of new providers, including ‘emerging donors’ (such as China and Saudi Arabia), private organisations, philanthropic foundations and non-governmental organisations. We believe existing aid architecture needs to be updated to meet the challenges of financing the post-2015 development framework. The target of spending 0.7% of gross national income (GNI) on ODA was first adopted in 1970, and reconfirmed many times since, including in 2005 by the 15 EU member states. In 2012 five donors met this target, but as a whole DAC donors achieved only 0.29% of GNI. 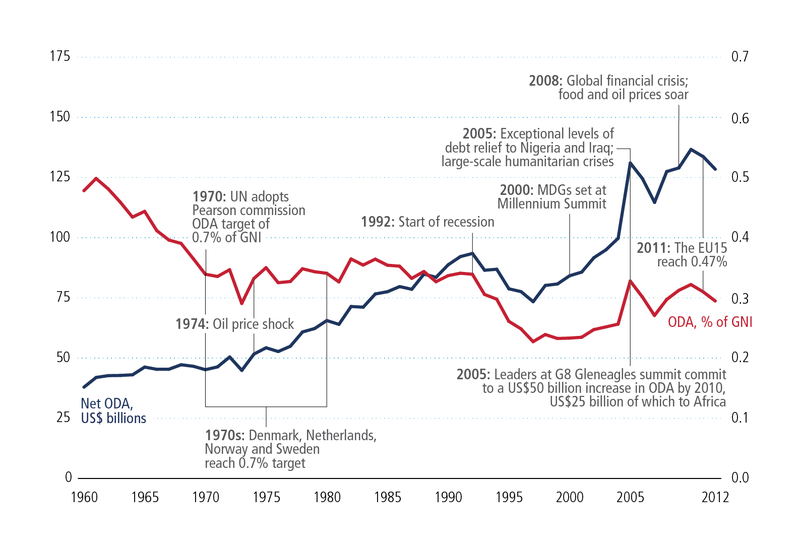 Global ODA has grown from around US$40 billion in the 1960s to US$128 billion in 2012. Nearly two-thirds of ODA comes from five G8 countries that are consistently the largest donors by volume: the US, the UK, Germany, France and Japan. While ODA is only a small part of the overall picture, it remains the largest international resource flow for 43 countries with over 250 million people living on less than $1.25 a day. The majority of these countries have very low government spending per person. For example, the total reported ODA to Liberia in 2011 exceeded government expenditure. In Rwanda, the value of ODA was equivalent to 80% of total government spending. Aid commitments to the governance and security sectors received the greatest share of bilateral funding in 2011 with 13% of the total, followed by health and infrastructure with 12% each. 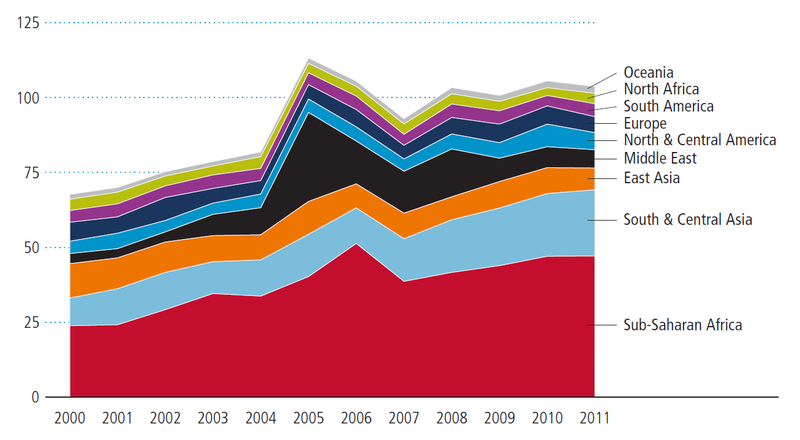 Sub-Saharan Africa receives the greatest proportion of ODA (35% in 2011), followed by South Asia (17%). Afghanistan was the largest individual recipient of net ODA in 2011 with disbursements of US$6.5 billion (6.9% of the total), followed by the Democratic Republic of Congo (US$5.4 billion, 5.7%). ODA will continue to be important. Although ODA accounts for a declining proportion of the total resources for ending poverty, it will continue to be important for countries with low government spending and large numbers of people living below the poverty line. As such, ODA should be recognised within the post-2015 development framework. Meeting the 0.7% target is critical. DAC donors should reach and maintain the 0.7% GNI target for ODA as one of a number of commitments to mobilise the necessary resources to end poverty. Revising the definition of ODA to reflect the changing aid landscape. The current definition of ODA should be revised to include assistance from non-traditional donors and the rules for what can be counted as ODA should be reformed to meet the challenge of financing the post-2015 development goals.